Feb. 11, 2011, 2:30 p.m.
By Megan Garber @megangarber Feb. 11, 2011, 2:30 p.m.
One of the winners of the January 25 uprisings in Egypt — besides, of course, the people of Egypt — has been Andy Carvin. NPR’s social media guru has been doing an exemplary job of curating social media to report on a weeks-long protest that seems to have transformed, today, into a democratic revolution. Carvin’s work cultivating sources and sharing their updates has turned curation into an art form, and it’s provided a hint of what news can look like in an increasingly networked media environment. “It really has stood out as an alternative model of news,” says Kinsey Wilson, NPR’s senior vice president and general manager of digital media. It’s also led to earnest talk of a Pulitzer for social media curation (with Carvin, of course, as the prize’s first recipient) and to equally earnest discussions, among Jeff Jarvis and others, of how to translate Carvin’s curatorial prowess into a full-fledged business model. It’s also led, Wilson told me, to more immediate questions of financial support among those who’ve been following, and benefiting from, Carvin’s coverage. How, they want to know, can they donate to it? The tweet, so far, has been retweeted directly by 54 people. And, more to the point, it’s been responded to with actual donations to NPR stations. (NPR doesn’t take money directly through its listeners, but rather through its member stations.) So far, the on-the-fly pledge drive has raised over $2,000, by my rough count — $2,215, to be precise — for member stations both big (WNYC, WBUR) and small (WOUB from Athens, Ohio). I should stress, of course, that the donation stats aren’t based on official, station-based pledge data. The info is cobbled together from the hashtag stream itself — by me, no less, not anything reliably automated — and, furthermore, it’s based on self-reported donation amounts and self-reported donation recipients. Some people who tweeted to the #gave4andy tag have indicated that they’ve donated, but haven’t included the amounts they’ve pledged (and so aren’t included in the total amount). Others have mentioned vague donation amounts — “monthly installments” and the like — and so, similarly, aren’t counted in the total. Still others may well have made donations without noting that they’ve done so on Twitter (or within the #gave4andy hashtag stream). So: Huge grain of salt. Still, though, the tweet, the tag, and the response combine to form an intriguing example of what can happen when you harness the power of a particular event, and a particular moment — and translate that energy to financial support. People, as the tweets flooding Twitter and the updates flooding Facebook can attest, love to feel that they’re part of something — particularly when that something is the making of history. Contributing financially to the reporting of human events can be a small, but quite meaningful, way to be part of them. That’s significant, because Carvin’s curation could easily be a matter of tension. Carvin works closely with NPR’s news team, Wilson notes, and “there’s a lot of communication back and forth”; still, the work he’s been doing — with Egypt, and before that with Tunisia, and before that with Iran, etc. — has largely been done under the auspices of his personal Twitter account. 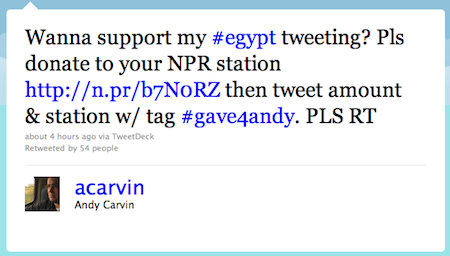 To the extent that, when people think of “that awesomely curated Egypt stream,” they usually associate it with @acarvin, rather than @NPR or @NPRNews. POSTED Feb. 11, 2011, 2:30 p.m.
Garber, Megan. "#gave4andy: Andy Carvin and the ad hoc pledge drive." Nieman Journalism Lab. Nieman Foundation for Journalism at Harvard, 11 Feb. 2011. Web. 18 Apr. 2019. Garber, Megan. "#gave4andy: Andy Carvin and the ad hoc pledge drive." Nieman Journalism Lab. Last modified February 11, 2011. Accessed April 18, 2019. https://www.niemanlab.org/2011/02/gave4andy-andy-carvin-and-the-ad-hoc-pledge-drive/.